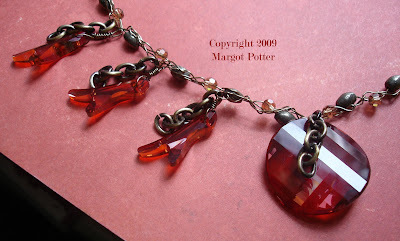 This is a design created from items I selected from the delightful folks at Rings n Things for their Blog Partner challenge. I've named it Fire and Water. I absolutely love this 26 gauge gun metal wire! I did a basic crochet chain stitch with just the wire. Provocraft has THE BEST crochet hook set with fabulous ergonomic handles I highly recommend, working with hard wire isn't easy! 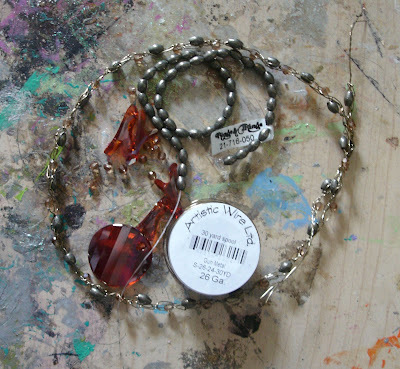 When I finished the crocheted core chain off, I used a separate wire to thread crystals and pyrite beads into the chain. In true 'impatient crafter' fashion, I knew I could figure a way around crocheting beads into the core wire, which is futzy and frustrating. I've also done this technique with nylon coated cabled steel wire and I found it a little easier to get fluid stitches, but I love the organic feel of this piece. I had to create wire wrapped bails for these magma CRYSTALLIZED™-Swarovski Elements coral pendants and I wanted to add more texture so I used some aged brass chain segments. 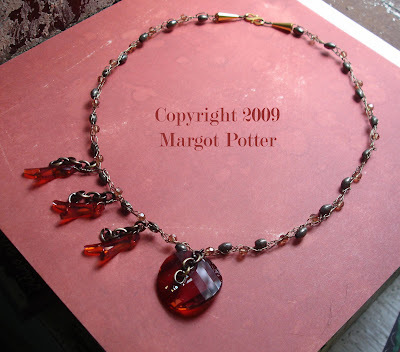 The focal piece is a twist pendant again in this luscious magma color. I've been playing with wire crochet for a while and I really love the way it looks. It's tough on the fingers, so be prepared, but it's really worth the effort. I'll be back in the blog saddle on Monday. Until next time...craft on with your bad selves! 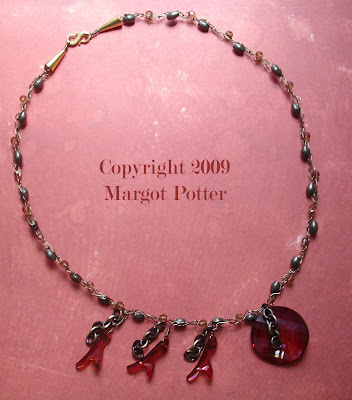 Hi Margot, your tip on threading the beads into the crocheted wire is a keeper. Thanks! Beautiful! I've tried crocheting wire with beads a couple of times a few years ago, and just wasn't ecstatic with the results. I love to crochet and I love beads and wire, so I think I'm going to keep trying. Thanks for the inspiration from this lovely piece!